Mother's Day is right around the corner. I found some fun challenges to participate in to make my Mother's Day card. I have a bunch of pre-stamped images that I leave in my drawer to use. I was sorting everything and found this adorable image. It just says Mother's Day all over. I pulled out my Copics and started coloring. I am not an experienced Copic marker user, so I basically wing it when I color. I am happy with the results though. To finish this card off, I stitched around the patterned paper, added some tiny pearls to the center of the flowers and popped the heart brad on the left of the sentiment. My favorite are the pearls accents on her hair. So cute! What a sweet Mother's Day card...adorable image. We're so glad you joined us this week at FOSTV. Hope you'll continue playing along with us. What a cute card! Such a sweet image ... and I love the details! The stitching around the outside adds a nice subtle border effect. Thanks for playing along with us at Made Especially for You! Beautiful card Kim. Thanks for playing along this week with FOSTV. Hope to see you again next week. Your card is so adorable! Great image she's a cutie! Love the sewing you did! Thank you for playing at PCI's In the Garden challenge! Thanks for joining us at Made Especially for You! Your card is adorable and your colouring is really great! Very pretty love your coloring! Thanks for playing along with us this week at SpeedyTV! What a sweet, sweet image. You've coloured it so nicely, and I like the way you've made it the focus of your card. Thank you for joining in this week's challenge at Card Crafter's Circle. This card is just too cute! I think you did a fantastic job of coloring it :) Thanks for joining us at Made Especially for you. So pretty. The coloring is amazing! Great job! Thanks for playing along with us at Made Especially For You! Very cute card. Thanks for playing along with us at Kaboodle Doodles this week. What a sweet image! Beautiful coloring and lovely Mother's Day card. Thanks for playing with Speedy Fox and Friends. Please join us again next week. Super cute card. Great lil girl. Thanks for playing along with us at ME4Y! What a darling card! I like the floral wreath with pearls in her hair! 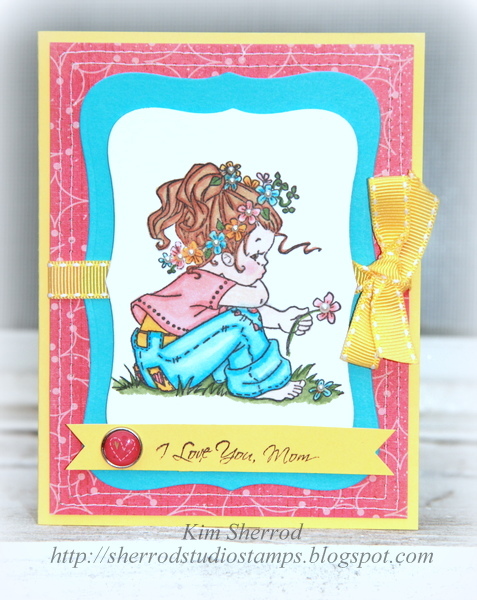 Thanks for playing in our 'Mother's Day' Challenge #43, and for using a Digital OR Stamped image! Cute image and I like the stitching on your paper - it adds and interesting detail. Thanks for joining us as FOSTV. Thanks for playing in our Mother's Day challenge this week at Card Crafter’s Circle. I really like how you made this banner sentiment, it's adorable!I'd love you to think about changing to comment moderation I have trouble with these words I have to type in to prove I'm not a robot! This is such a pretty card! I love the color combo! Thanks for playing with us at Made Especially for You! What a precious card! :) Thanks so much for playing along with us at Made Especially For You!